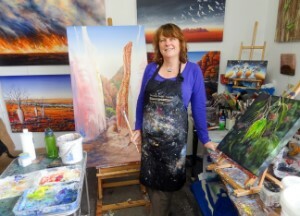 Linda will be conducting a number of painting workshops in her Melbourne studio during the first half of 2017. These workshops are strictly limited to 4 people and are designed to be an intimate and intensive learning experience. 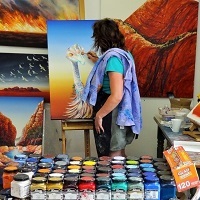 The aim of these workshops is to explore the foundation skills that are necessary to enable artists to take their work to the next level and are suitable for beginners or artists who wish to consolidate their core painting skills. With workshop notes and the use of a large range of materials included in the price, it’s a great opportunity to try out a range of art materials and techniques without the upfront purchase cost. The dates for 2017 are listed below. Places in these workshops fill up fast so you will need to email Linda at lmacaulay64@gmail.com and pay your non-refundable deposit to secure your place. All studio workshops for 2017 are fully booked. Please join Linda’s subscription list to be advised of future workshops. Colour Mixing and Colour Theory – 4 & 5th Feb 2017, Melbourne Studio Workshop 2 Days 10 – 4pm Suitable for oil, acrylics, gouche or watercolour Fully Booked – Contact Linda to add to cancellation list. During this intensive 2 Day weekend workshop you will complete a colour mixing and colour theory workbook that will take you through the fundamentals of colour mixing and colour theory. Learn how to mix any colour, how to create colours that glow, how to mute a colour and how to choose colour schemes that work together. This is the workshop everyone should do before they begin to paint. Acrylic painting mediums allow you to use acrylics in an endless variety of ways from wet on wet to heavy impasto work. It can be challenging to work out which mediums to buy. In this one day intensive workshop you will get to play a large range of mediums and see how they all work. With workshops notes provided this course provides a great introduction to the world of acrylics. Learn the secrets of Linda’s smooth blending combined with dry brushing and wet on wet techniques to create out of focus backgrounds in acrylics. This workshop allows you to paint 3 different backgrounds using 3 completely different techniques. With practice you can learn to use a very limited range of brushes to make an endless variety of marks that come together to form a realistic painting. Learn how to use all your brushes and then decide which ones best suit you. We will also look at how tonalism forms the basis of any realistic painting and learn methods that will help you see which tones are needed and then identify the brushwork needed to create them. Please phone Linda on 0407539800 or email at lmacaulay64@gmail.com if your interested in any of the courses. She will then email you an enrollment form. Payment can be made through Paypal, Credit Card or Direct Deposit. Cost: $100 per workshop day. A 50% non refundable deposit is needed to secure your place in a course. The balance of payment is due one month before the commencement date of the course. There is a 10% discount on 2 or more courses. Payment: Bank Transfer, BPay, Credit Card or Cash. Please email Linda at lmacaulay64@gmail.com for an enrollment form. Lunch: Participants will need to bring their own lunch and snacks…tea and coffee provided. Hours: 10am till 4pm daily. If there is enough interest Linda may also be running the following courses in the second half of 2017. Cant find what your looking for here….visit the workshops page linked below for a complete list of Workshops Linda will be running this year.